Summer arrived in New York last weekend, suddenly and unexpectedly, like an uninvited guest. As I biked around our neighborhood, collecting ingredients for a Mother’s Day meal from more retailers than most would deem reasonable, I was struck by the outrageous greenery I think must have sprung up overnight, while we were all asleep. Asparagus just arrived at the market and I have not seen a single sugar pea, but still, all evidence suggests summer. Honestly, I feel a little gypped. 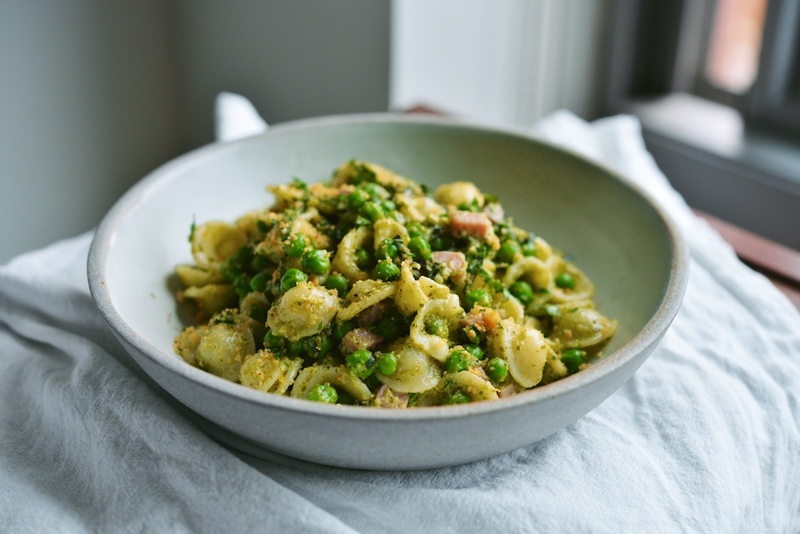 I love spring, and there is a snap pea salad recipe I’ve been waiting to work out. I have a friend who is happy. There is no other way to describe it–she is generally, genuinely, effervescently happy. Of course she is not without her troubles or hardships; when she is sad, she fully embraces sadness, a two handed hand shake. But she does not dwell in sadness or self doubt. She has a natural, easy ability to see the best in people. She is a loving friend. I often wonder–are some people born preternaturally happier than others? Or is happiness instead a conscious choice, or maybe a series of micro choices? Does it care where you’ve come from, or more about where you are going? Lately, I have been lifting a lot of metaphorical stones. Once I turned over the first, another and another and another followed suit. I think this process is actually a healthy one, but for the present, my thoughts are a bit of a jumble. What makes me happy? What is the path to success, in all its varied configurations? I like to have a plan–a hyper-detailed plan, usually–but currently I am operating planless. Where do I locate step one? How do I clear away the debris in order to build something solid and fortifying and good? I think this is why I love to cook. The kitchen provides focus. The process of preparing food from scratch is slow and methodical. It requires patience. The simple tasks–bringing a pot to boil, reducing herbs into ribbons–are hypnotizing, calming. And there is satisfaction to be found in concretely completing a task from start to finish. When I put the spoon down, there is a tangible result: dinner. Creating it fortifies me, and gives me something solid and good to share with the Frenchman. We both benefit. 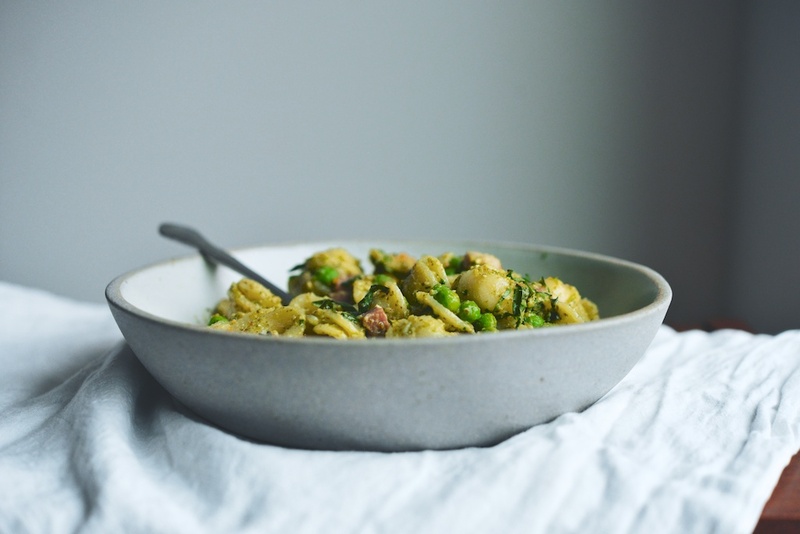 I’ve made this pasta for the two of us several times since March, the month I hoped spring would start. 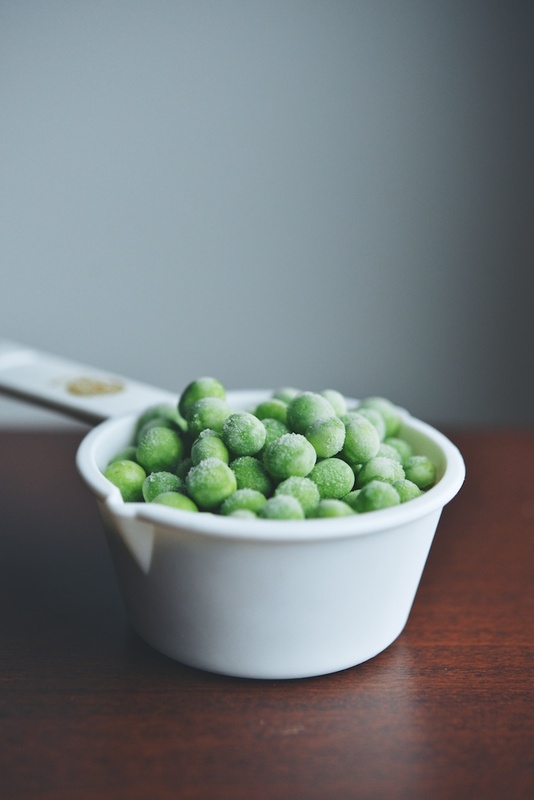 I began using frozen peas, but fresh would be welcome, if it’s the season. I find Jambon de Paris at the deli counter of my supermarket, but leftover Easter ham would also be delicious. (At the deli, just specify how thick you’d like the slice cut, see ingredients.) If you are a vegetarian, skip the ham; you might substitute mushrooms instead. 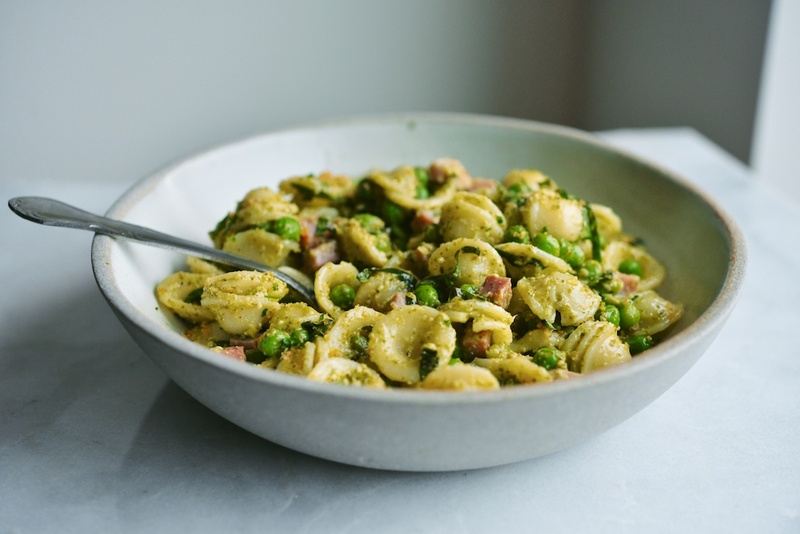 You can use any kind of pesto, really, but I think the pea shoot version makes this extra springy, slightly lemony, and it pairs well with the peas, ham, and crème fraîche. 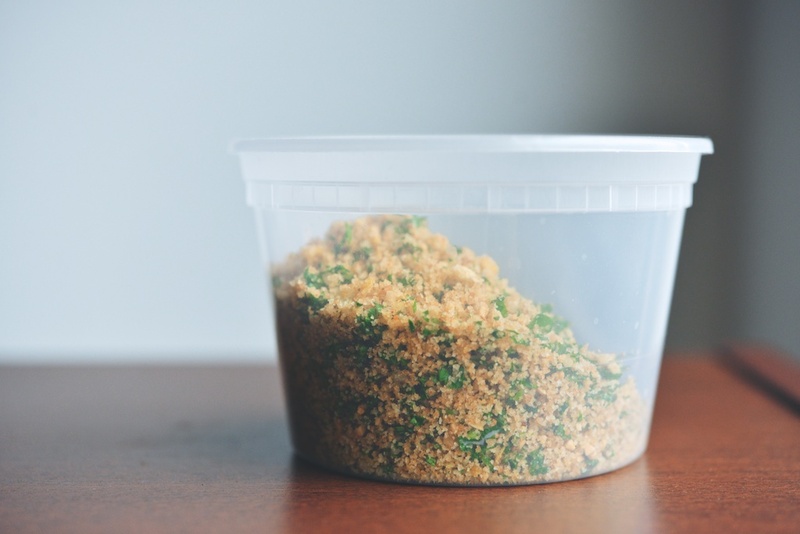 Repurpose any extra pesto or breadcrumbs throughout the week; both keep well in the refrigerator for about that long. Serves 4-6. 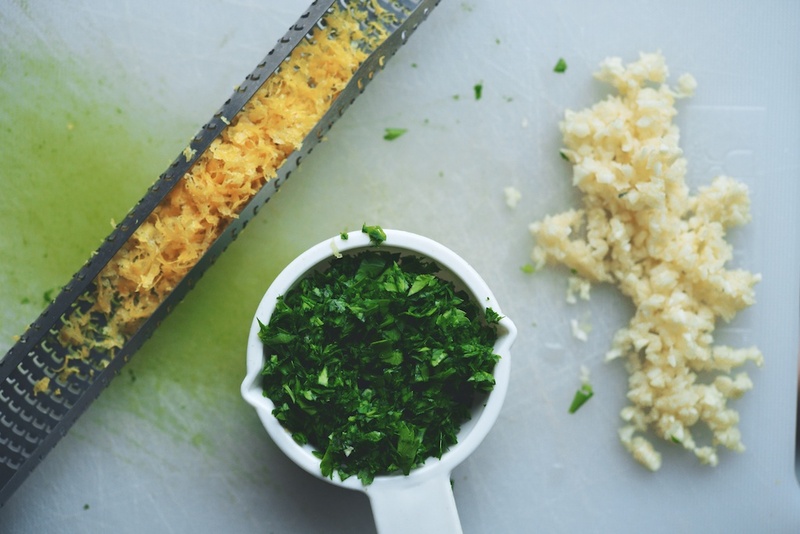 Mince the garlic and the parsley, zest the lemon; set all three aside. Set a wide saucepan on the range over medium heat. 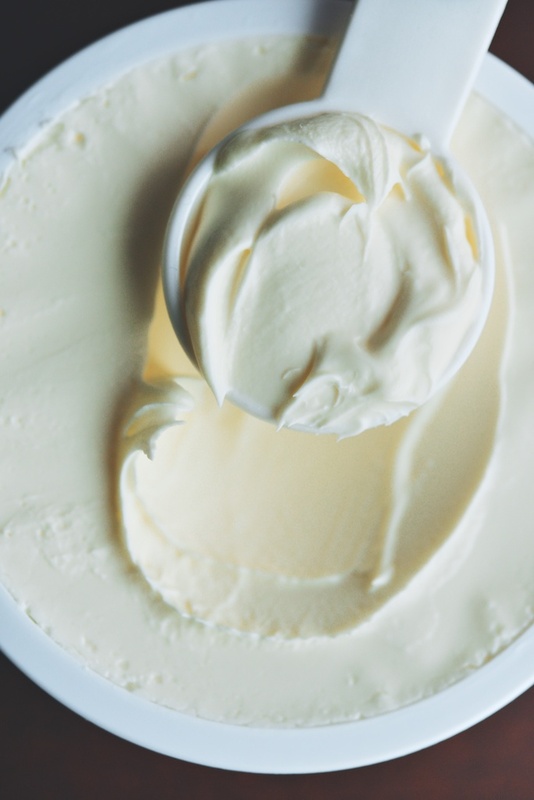 Add the olive oil and the butter; when the butter is foaming gently, add the breadcrumbs. Stir to evenly coat the breadcrumbs in the oil and butter. Add the minced garlic, and stir again to coat. Allow the breadcrumbs and the garlic to toast for about 7 minutes, stirring occasionally. Add the lemon zest to the pan. 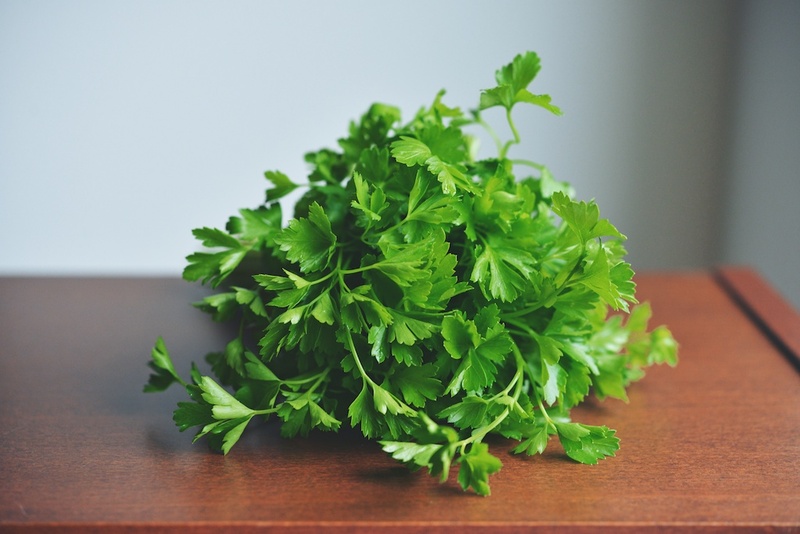 After 1 minute, turn off the heat, and stir in the parsley. 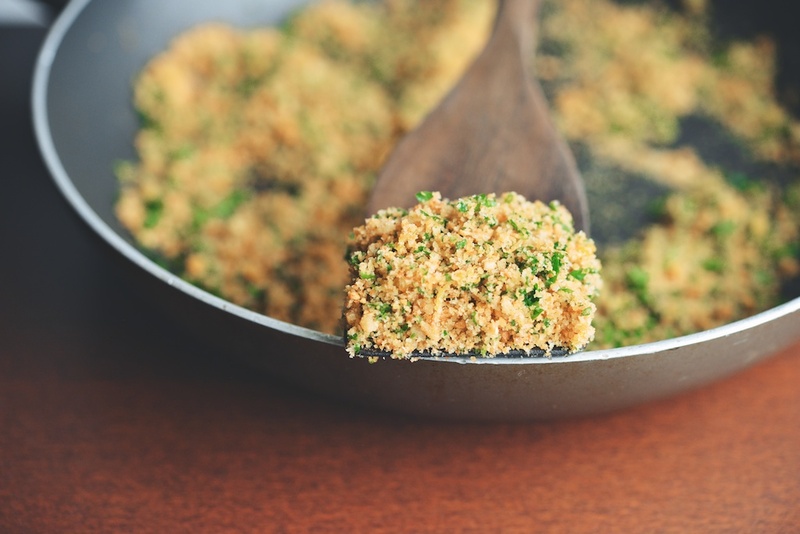 Set the seasoned breadcrumbs aside. 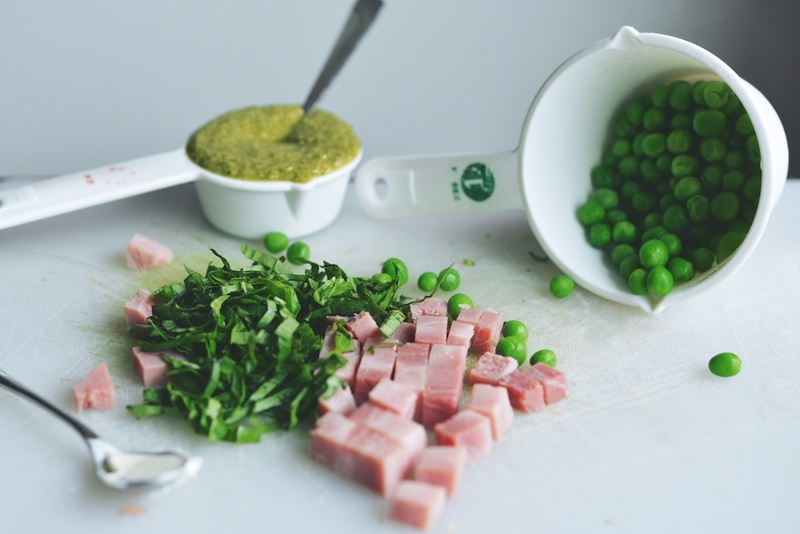 Ribbon the basil and cut the ham into small cubes; set both aside. 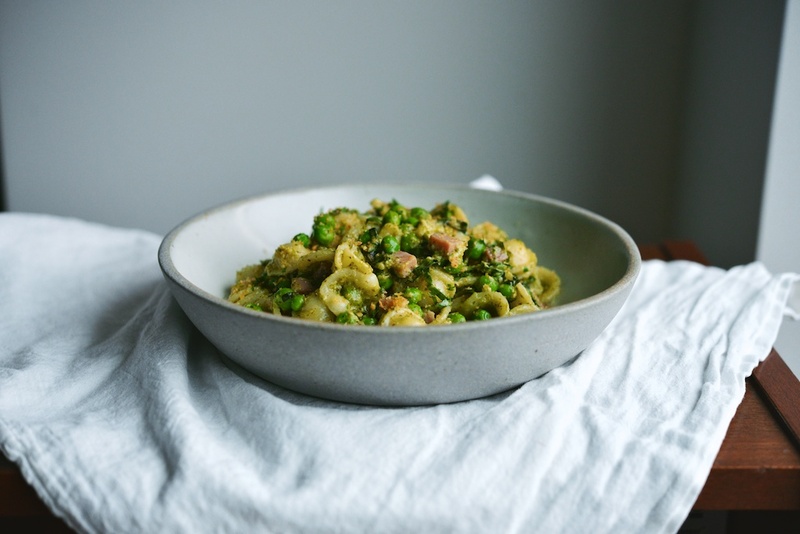 Cook the peas; you can do this in a small pot on the range, or in the microwave. 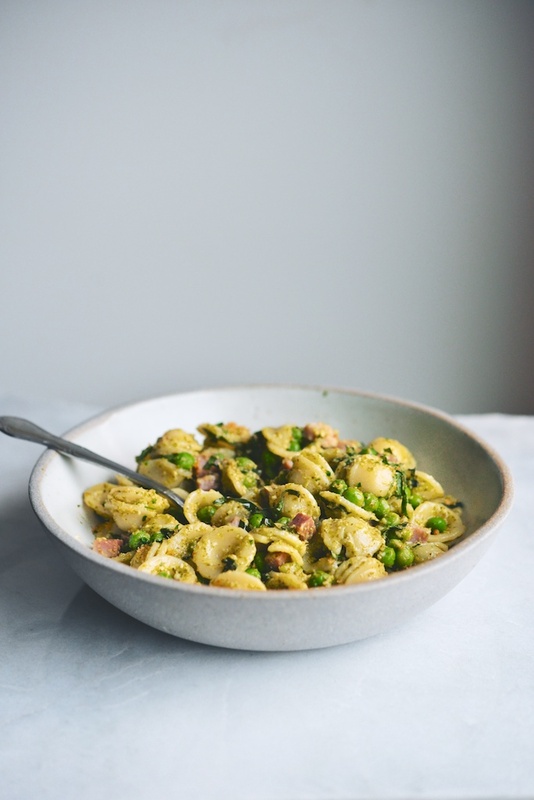 Either way, cook them gently–you want the peas to be bright green and not at all mushy. Drain the peas and set them aside. When the pasta is finished cooking, drain it, reserving 1/4 cup of the pasta water. Add the pasta back to the pot and, over barely any heat at all, stir in the crème fraîche. Stir in the pesto. 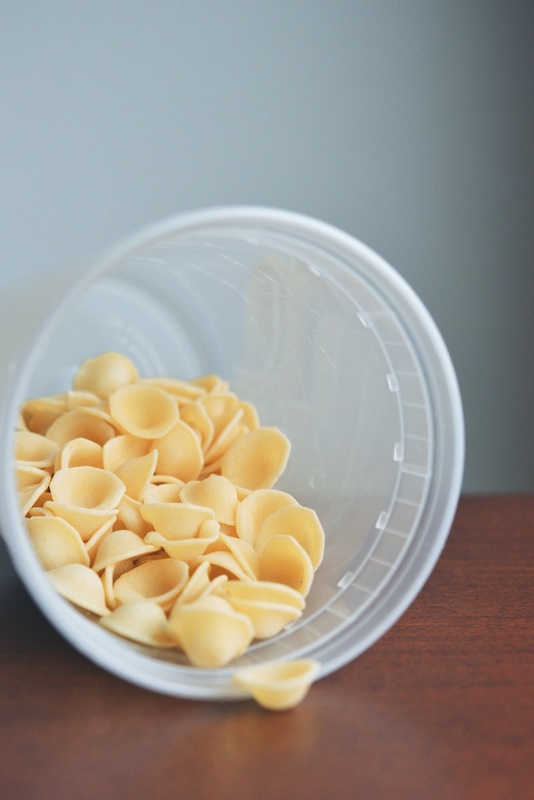 If the pasta looks dry, add some of the pasta water back 1 tablespoon at a time. 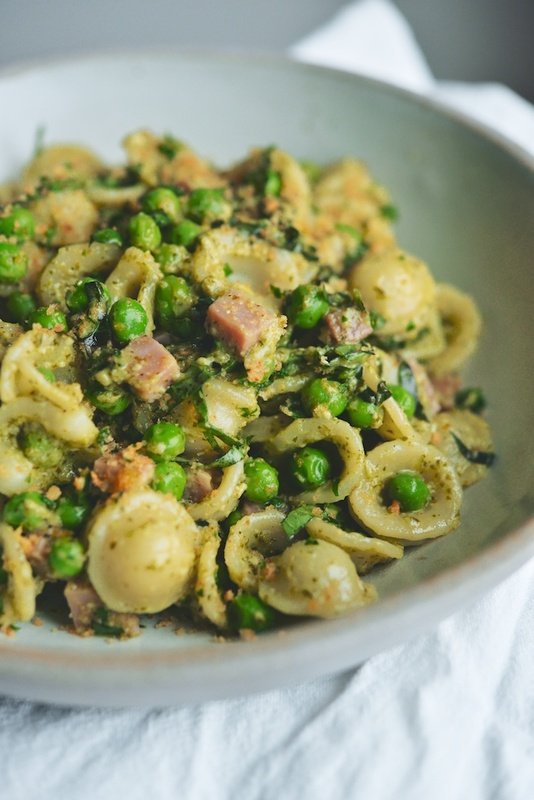 Stir in the basil, the ham, the peas, half of the breadcrumbs, and several cracks of black pepper. Portion the pasta into bowls, and top with the remaining breadcrumbs. Serve immediately. Yum! Beautiful writing – I totally relate – the kitchen is my zen zone. Wise thoughts to reflect upon, plus a delicious dish! Thanks so much for your thoughtful comment, Jessie. It means a lot to me! Such lovely light in these photos. Sometimes choosing to be happy in a time of uncertainty is where the real magic happens. Going along for the ride in a positive way when we don’t have the answers can be just the break we need. I understand where you’re at, and appreciate your sharing! Just made this. It’s incredibly delicious. Thank you! I’m so glad you liked the recipe, Luke! This post, this recipe, these photos, your words — it all just brings so much peace to my heart! I know that sounds a little sentimental but it’s true. 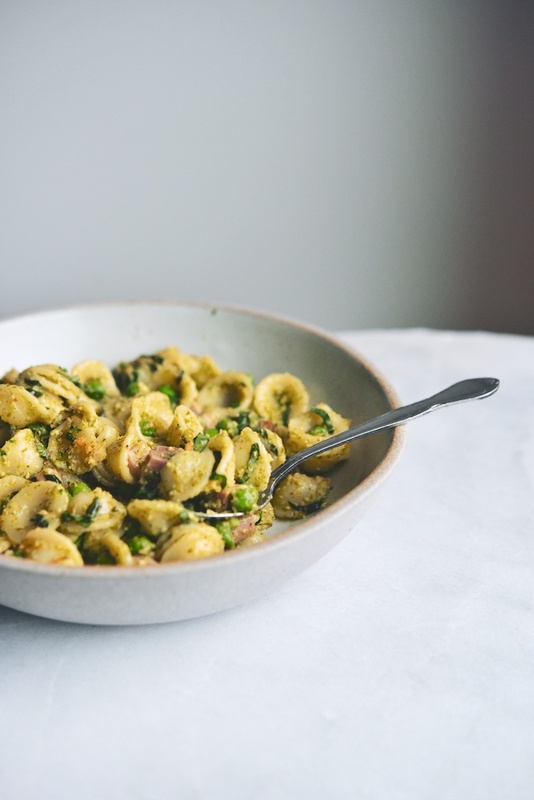 The light in your photos is beautiful, and the combo of ingredients in this orecchiette is nothing short of masterful. It sounds beyond delicious! Also, a bit of extra admiration for your lovely friend — people like that bring so much light into our lives, and at the same time, are such a model for me to strive toward! Goodness knows I could use a lot more of that attitude and less of the negativity that I succumb to often. Thanks for this wealth of inspiration, Cristina! Thank you for reading, Cynthia, and thank you for your kind words!